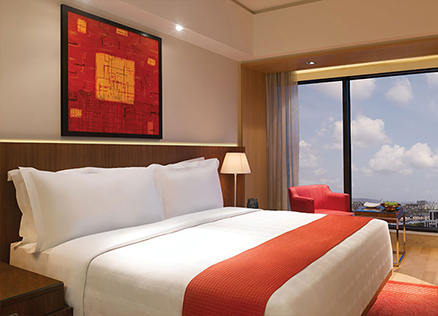 Experience contemporary luxury and innovative design when you stay in a Trident hotel room in Mumbai. Our rooms and suites have been furnished with utmost attention to detail to make your stay comfortable and convenient. 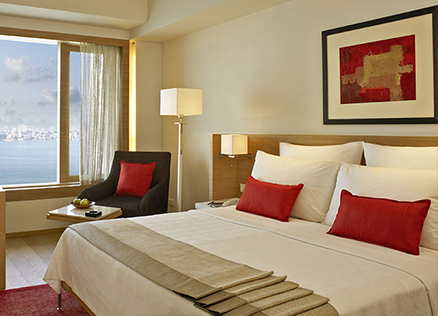 Our spacious suites are stylishly designed and laid out with a 'residential feel' to help you relax and unwind. We offer modern amenities like well-appointed writing desks, LCD televisions and complimentary high speed Internet access. Floor-to-ceiling windows paint the rooms in warm hues of natural light, creating a calm and refreshing ambience. Dotted with specially commissioned artworks by leading Indian contemporary artists and punctuated with delightful accents of red in the upholstery, our hotel rooms in Mumbai offer breathtaking views of the ocean and Marine Drive or the city’s iconic skyline. The oakwood floors, dark walnut furniture and handcrafted furnishings further enhance the cheerful vibe of these luxurious accommodationss. With a light oakwood floor and red accents in the décor, the Deluxe Rooms have a warm, inviting ambience, complemented by functional and contemporary design, while the thoughtfully designed, spacious Premier Rooms have been decorated and furnished with fine attention to detail and contemporary style. For discerning business executives who are always on the move, we recommend our Trident Club Rooms located on the exclusive Trident Club Floors. For those who prefer to relax, the elegantly appointed one bedroom Deluxe Suites offer a refreshing view of the hotel’s swimming pool. Measuring 550 square feet, Trident Club Suites are the preferred choice for our discerning business guests. Host to top corporate executives and numerous international celebrities, the Presidential Suite occupies the top floor of the hotel and is spread over a vast 2,400 square feet. With an exclusive entry, the Presidential Suite is an impressive accommodation with its effortless style and painstaking attention to detail. Offering stunning views of the city, the Premier Rooms at Trident, Nariman Point feature handcrafted furniture and original artworks by local artists that add a classic charm to the décor. Measuring 300 square feet, the Superior Rooms offer a view of the Nariman Point skyline, while the Premier Ocean View Rooms offer serene views of the ocean and capture the essence of Mumbai in their décor. Located on the Club Floors, the Trident Club Rooms are designed to provide an exclusive retreat for guests in a comfortable environment with efficient service. The spacious Executive Suites are thoughtfully appointed with all the modern amenities our discerning guests need. Measuring over 890 square feet, the generously appointed Deluxe Suites offer breathtaking views of the ocean. The well-appointed Trident Special Suites are spread over a vast 1,480 square feet, while the thirty-third floor Presidential Suite (1,800 square feet) offers panoramic views of the ocean from the living room, a dining room and two bedrooms.